Beans make for a great snack. Just a few of the benefits: they are low in calories and fat - they curb cravings - increase your energy - satisfy your appetite - prevent the enzyme alpha-amylase from turning carbs into sugar - block absorption of 2/3 carb calories - boost weight loss up to 230% - are a great plant protein with slow digesting soluble fiber - and are very inexpensive! For a tasty dip/spread to snack on anytime you've got the munchies here you go - this is more of a "method" or "format" than a recipe because you can change it and make it into really any flavor you're in the mood for. For example: I'll make plain hummus the first day and then I'll switch it up by adding roasted eggplant or roasted red peppers or black olives or sundried tomatoes or roasted garlic (personally, I don't like adding raw garlic because it overpowers the whole thing) or fresh herbs . . . the flavor list is endless! I love ice cream. My husband loves ice cream. We indulge on occasion, but not as often as we used to because of the sugar, fat and extra calories. Let's face it . . . we're older now and just can't eat the way we could back in our 20's. I workout hard in the mornings, and don't want to undo what I've done with a bunch of empty calories and fat. So, I kept looking for ways to come up with a healthier version of ice cream. Tried some, didn't like 'em. Tried again, too much work. Finally, I think I've got the perfect tasty, and easy recipe . 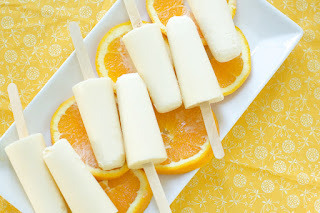 . . and now when we get a craving for something cold and sweet, I make my frozen "Dreamsicle." Ch - Ch - Ch - Chia!